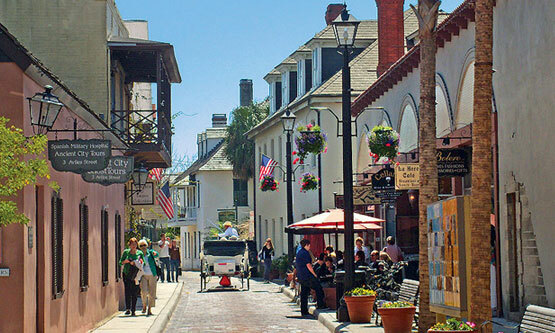 As one of the "Ten Most Walkable Cities in North America", according to AAA travel editors, St. Augustine allows visitors to absorb the personality and essence of the city on foot. The 144 square block historic district, within which St. Francis Inn is located, features 29 buildings listed on the National Register of Historic Places. While staying at St. Francis Inn, guests can easily walk through over four centuries of history along the ancient narrow streets leading to the Plaza de la Constitucion, established by royal decree in the 16th century. 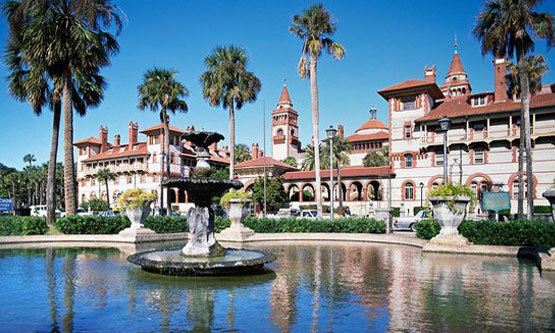 The magnificent hotels of the Henry Flagler era, dating from the end of the 1800s, represent the very best Spanish Renaissance architecture in the U.S., preserved today as Flagler College and the Lightner Museum. Quaint boutiques, dozens of art galleries, and a wide range of restaurants featuring local cuisine provide tempting diversions to the museums, churches, and numerous historic points discovered on every stroll through the Oldest City. From the Inn, you will often hear the "clip-clop" of horse-drawn carriages, touring the neighborhood's narrow brick paved streets. The Inn is just one block away from "The Oldest House" (50% off admission for our guests), the St. Augustine Historic Society, and numerous other notable homes, churches, and museums. The Llambias House and its gardens, directly across St. Francis Street, is a lovingly maintained restored historic home, and host to many weddings and functions of St. Francis Inn guests. St Francis Inn is in the Historic Old City district of St. Augustine, Florida, our nation's oldest continuously settled city. The city reflects its Spanish heritage, dating back to 1565, with its central plaza, tile roofs, and native coquina-stone buildings. 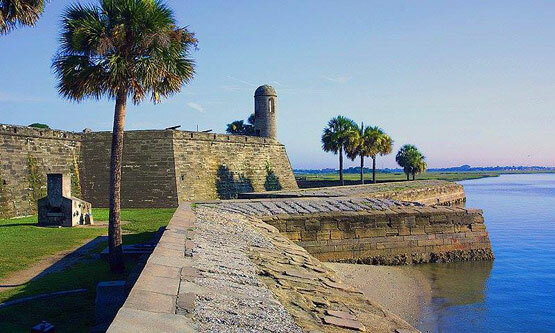 The Castillo de San Marcos – St. Augustine's historic bayfront fort – offers a unique look at the past. A 20-year period of British rule greatly affected the look of St. Augustine today, as the British settlers added wood clapboard second floors to the existing Spanish homes, with balconies overhanging the roads. The old city is a vibrant historic place, with year-round events and festivals, ongoing re-enactments, and historic preservation areas where homes and businesses exhibit ways of life from past centuries. Learn how the Spanish, Minorcans, British, other European nationalities, and Native Americans have contributed to the development of our city. Feel the blast of a cannon firing at the fort, join a candlelight procession through the old city streets, or experience the daily life of early settlers. Gaze through Tiffany windows at Flagler College, built by Henry Flagler as the elegant Ponce de Leon Resort in the late 1800s. Hear an organ concert in the Memorial Presbyterian Church, which Flagler had constructed by Italian artisans in memory of his daughter. Hunt for antiques in shops lining a hall originally built as the first indoor resort swimming pool. Hear ghostly tales as you walk old city streets at night. 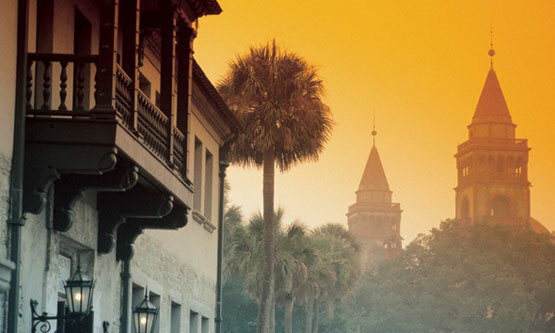 History lives in St. Augustine, and you can be a part of it! We've created a list of recurring annual events, so you can see what's happening during your visit to the Inn. For an up-to-date calendar of events, including Festivals, Living History, Visual Arts, Performing Arts, Literary Arts, Cultural Events, Classes, and much more, visit Historic Coast Culture and Old City Calendar.